Do you think of healthy food when you think about eating in a Tex-Mex restaurant? Most people don't. But there are so many ways to cut Mexican food calories when you eat out. You just have to know how to make smart Mexican food nutrition choices so you are satisfied with your meal and keep your healthy eating plan on track. 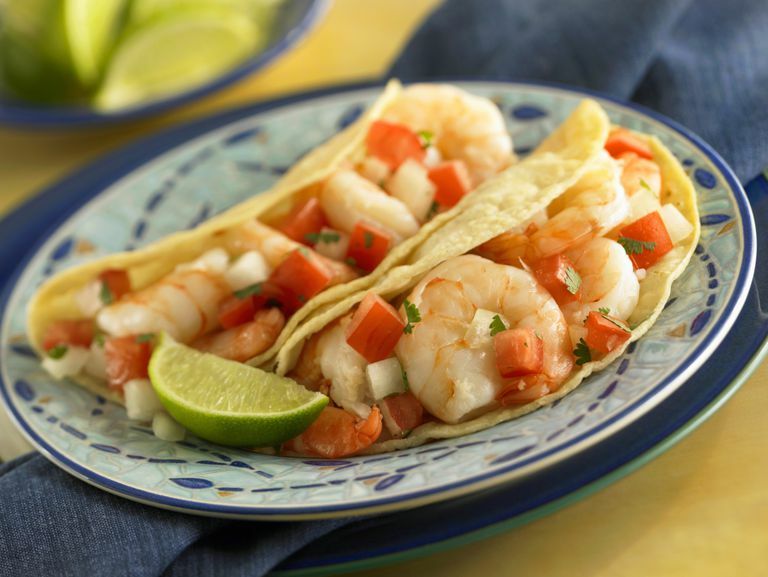 Traditional Mexican fare is made from fresh vegetables, fresh fruit, meat, and seafood. So most of the ingredients in authentic Mexican or Tex-Mex food are good for your diet. And the spicy flavor makes it a great choice for dieters. It is hard to overeat food when it has some heat. But many times, when we visit a Mexican restaurant we order the cheesy, fried dishes that can derail a smart eating program. So what should you order instead? It's easy to indulge in diet-friendly Mexican food if you stick to a few guidelines. When you visit any restaurant, you'll be more likely to eat a low-calorie, healthy meal if you follow smart guidelines. Make your menu selection in advance. Visit the restaurant website and choose your meal when you're not hungry or distracted. Have a festive drink before, not during, dinner. If you love to have a Tex-Mex inspired cocktail, either make a skinny margarita at home or enjoy one when you get to the restaurant. Then eat your meal with water. Skip dessert. Your meal will fill you up. After your plate is clean, enjoy the pleasure of your company and skip the high-fat treats. So how do Mexican food calories stack up? Be careful. Sometimes the healthy sounding entrees and offerings are full of fat and calories. One of the most popular items on the Tex-Mex menu is the taco salad (nutrition label shown). It sounds healthy because it has "salad" in the name, but the calorie counts for this large entree can vary significantly, with some salads topping 900 calories. For example, if you order a salad that comes in a fried taco shell, you should add about 300 calories and 16 grams of fat to your meal total. And any toppings that you add, like sour cream or guacamole, will increase your totals as well. A salad at Chipotle with steak, white rice, black beans, roasted corn salsa, cheese, and romaine lettuce contains 685 calories. Add chips for a little bit of crunch and your salad is now 1225 calories. And if you add guacamole, you're now consuming1455 calories. At Chili's, the popular Quesadilla Explosion Salad has 1400 calories and 93 grams of fat. Even if you split the salad with a friend, you may be consuming more fat and calories than you need at one meal. These are Mexican food nutrition facts for entrees served at many of the country's most popular restaurants. The calories in guacamole come mostly from the healthy fats. A single serving of two tablespoons of guacamole contains 50 calories, 4.5 grams of fat (2.5 grams saturated fat), 240 mg of sodium, and 3 grams of carbohydrate, and 1 gram of protein. It's a relatively low-carbohydrate food, but it's easy to pile up on this creamy dip, so be mindful of portion sizes. And if you add chips to your guacamole, you're likely to add about 300 calories or more, depending on how many you consume. Combination platters are also very popular in Mexican restaurants. Unfortunately, however, these meals almost always provide way more food than you need. As a result, you can easily consume 1000 calories or more depending on how your meal is prepared. For example, consider any of the small entrees above. If you consume three beef tacos, plus rice (about 100 calories) and refried beans (225 calories) and you're already at 865 calories. If you add extra cheese, guacamole, or sour cream, you'll easily top 1000 calories. If you're trying to slim down, avoid foods that are fried or covered in cheese or creamy sauces. You should also go light on the guacamole. The dip provides plenty of healthy fat, but the calories in an avocado add up quickly, so enjoy it in moderation. You may also want to avoid chips and salsa that might be included with your meal. In fact, many smart dieters ask their server not to put it on the table at all. It's too easy to overeat. If you do choose one of these higher calorie dishes at a Mexican restaurant, split the meal with a friend or have half of the entree wrapped up to eat at another time. The best way to enjoy Tex-Mex food while you're on a diet is to make it at home in your own kitchen. That way you can control the portion sizes and choose lower calorie ingredients. Grill fish, shrimp or chicken for tacos, enjoy a lean steak fajita or make your own taco salad with crunchy vegetables and a small amount of cheese.